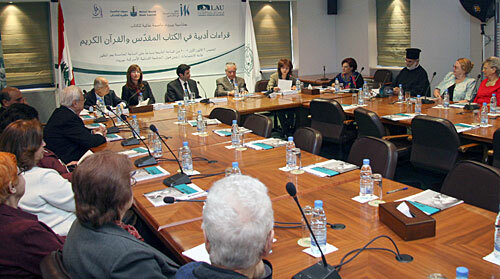 The event was attended by researchers and academics from universities across Lebanon, and religious figures of different denominations and sects. Researchers and academics from universities across Lebanon, and several religious figures of different denominations and sects attended the "Literary Readings in the Bible and the Quran" conference at LAU. The role of women in the Bible and the Quran was the subject of a conference entitled “Literary Readings in the Bible and the Quran,” organized by LAU’s Institute for Women’s Studies in the Arab World and Al Bahithat al Loubnaniat — a collective of female Lebanese researchers — and co-funded by the Ministry of Culture, on December 3, at the Irwin Hall Auditorium, LAU Beirut. The event was attended by researchers and academics from a number of universities across Lebanon, as well as several religious figures of different denominations and sects. Lebanese Minister of Culture Salim Warde was in attendance and pointed out that literary readings of the Holy Books are important unifying elements of convergence and mutual understanding. LAU President Dr. Joseph G. Jabbra attended the conference and said that the university has always supported the education of women. He expressed his view that the Holy Books, the Bible and the Quran, both talk about the important role of women, adding that in Lebanon, women are not working hard enough to gain their rights, perhaps due to social fears, and as a result are assuming their happiness. Jabbra said this situation is unacceptable, since Lebanon pretends to preserve women’s rights. Lebanese women often face more challenges in their quest for equal rights, than women in other countries. He added that Lebanon should clearly understand that the Universal Declaration of Human Rights provides equality between men and women. Acknowledging that the conference’s theme was very sensitive, Dabbous-Sensenig focused on the importance of the academic scientific research that uses theory and methodology in order to provide reliable readings of the Holy Books. She said that literary critical readings of the past and present centuries were able to highlight the positive role of women, which is addressed in the Bible and the Quran. Dabbous-Sensenig added that unlike men, women in the Bible where the first to believe in Jesus’s death and resurrection. Similarly, in the Quran, critical readings were done that defended a woman’s rights, and reinforced the fact that men and women share the same rights and duties.